In recent years, an increasing number of senior citizens over the age of 65 are interested in the benefits gained by undergoing cosmetic procedures. Plastic surgeons commonly offer their services to people of all ages, however, Rhode Island hourly caregivers question whether elderly people are putting their safety at risk. The American Society for Aesthetic Plastic Surgery reports that more than 84,000 patients over 65 voluntarily underwent cosmetic procedures in 2010. The following statistics indicate the number and type of surgeries performed. Additional data reveals that seniors in smaller numbers also elected to have breast augmentations, breast lifts, and forehead lifts. The concern for seniors who undergo these surgeries stems from the many medical conditions that older people typically develop combined with the various medications needed to live healthy, productive lives. For example, seniors are more likely to have cardiovascular disease and diabetes, both of which increase the risk for seniors. Many seniors also take medications that interfere with blood clotting ability. These factors put older Americans at a higher risk of certain complications during or after surgery. Potential candidates who are decades younger do not usually carry these risk factors. 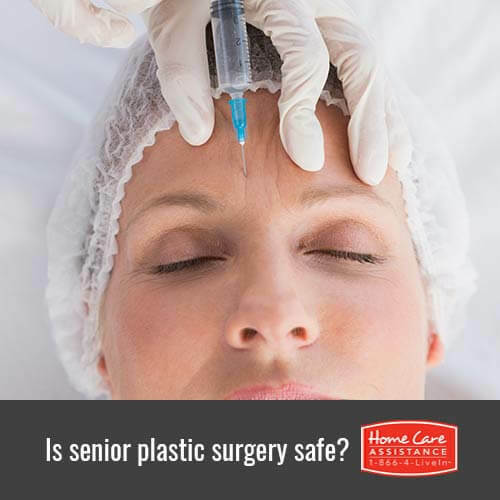 While cosmetic physicians understand and recognize the risks involved when treating older clients, surgeons have the right to refuse to perform certain procedures if the surgery endangers the patient. Prior to performing any type of cosmetic procedure, physicians must carefully screen every client and provide each with sufficient information to ensure that individuals make an informed decision. Physicians from the Cleveland Clinic studied the effects of elective surgery on seniors. For three years, the group followed 216 women who were all over the age of 65 and chose to undergo facelifts. All were subjected to pre-operative screening prior to their procedures. The results of their findings concluded that the women continued to enjoy healthy lives and did not have a significant risk of complications during or after surgery. Should your loved one undergo plastic surgery and need help with the recovery process, turn to Home Care Assistance in Rhode Island. We provide flexible live-in and hourly home care to help seniors recover quickly and efficiently in the comfort of home. Our dedicated caregivers will help your loved one recuperate from surgery by offering medication reminders and personal care assistance. Contact us today at (401) 284-0979 to learn more about our in-home care and schedule a free consultation.